Apple has created a completely new version of its MobileMe Calendar, and subscribers of the $99-per-year service can now sign up for the beta to be selected in the coming weeks. Users can sign up by going to me.com/calendar and clicking on "Request an invitation." They will then receive an e-mail notification to let them know they have been added to the beta. Apple said they will add members in the order of their request in the coming weeks. Beautiful new web application: The Calendar beta includes a new web application at me.com with great-looking calendar views. You'll find redesigned day, week, and month views, as well as a new list view to make scanning your events easier. Your calendars will also load faster, thanks to improved performance. The new web application works best with Safari 5, Firefox 3.6, and Internet Explorer 8. Share calendars with family and friends: You can easily share your calendars with one or more MobileMe members to keep everyone on the same page. For example, create a shared calendar called "Kids" for school and weekend activities. You can allow the person you're sharing a calendar with to edit events, and set up email notifications to tell you when they make a change. Publish a calendar for a group or team: The Calendar beta lets you share a read-only public calendar that can be viewed by anyone, perfect for publishing an events calendar such as a soccer team schedule. After setting it up you can send the team members a link to view the calendar on their iPhone, iPad, iPod touch, Mac, or PC. Event invitations with RSVPs: Inviting any guest to an event is easy from the MobileMe Calendar beta. Just add their email address to the event (they don't have to be a MobileMe member) and your guests will get an invitation email they can respond to directly by clicking a link. Your event then automatically updates, making it easy to track RSVPs right in your calendar. Works on iPhone, iPad, iPod touch, and Mac: The MobileMe Calendar beta uses the CalDAV standard so you can view and edit your calendars using the built-in calendar applications on your iPhone, iPad, iPod touch, and Mac. Please note that support for PCs with Microsoft Outlook is coming soon. 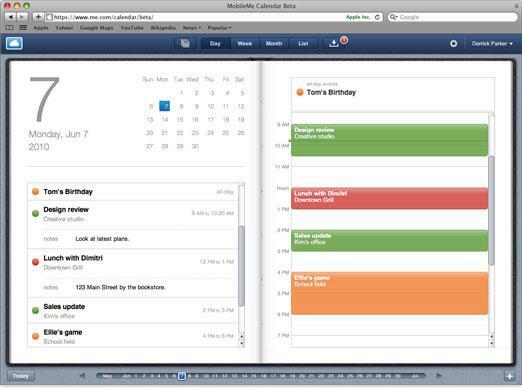 The MobileMe Calendar beta requires users to be running iOS 4 on an iPhone or iPod touch, iOS 3.2 on the iPad, or Mac OS X Snow Leopard 10.6.4. In June, Apple refreshed MobileMe Web applications for both the desktop and iOS devices. The new interface refreshed the look for e-mail, following a beta period that began in May. The new mail offers a widescreen view interface, improved performance, server-side e-mail rules, a formatting toolbar for adding rich text to e-mails, and new SSL security when composing and sending e-mail. In addition, this week Apple added iPad support, as well as multitasking support within iOS 4, for its MobileMe iDisk application. The free software, which also requires a MobileMe account, allows users to remotely access files saved online. With the update, users can play audio from their iDisk while using another application.